Biryani is a combination of rice and spices, cooked with vegetables, meat, fish or eggs. The type of rice commonly used when making biryani is basmati rice. It is usually complimented with curry. 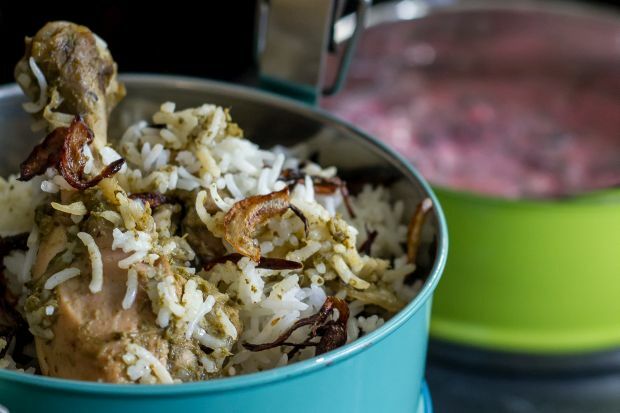 Nothing beats the classic chicken biryani. Chef Sapna Anand is a renowned chef who puts a modern twist to traditional Indian dishes. This recipe is from her cookbook, New Indian Kitchen, which is available at MPH bookstores. She also conducts cooking classes at At 19 Culinary Studio where she shares her cooking experiences and techniques. She blogs at My Test Kitchen and has a FB page under the same name. Photo courtesy of Sapna Anand. Rinse the chopped chicken and thoroughly drain out all the liquids. In a non-metallic bowl, rub the chicken with salt and lemon juice. (Use a non-metallic bowl when marinating because it will not react with the acid in the lemon that will cause spots around the bowl). Refrigerate the chicken while you prepare the marinade paste. Over a low heat, dry-roast the cloves, black peppercorns, cinnamon, cardamons and star anise for 3-4 minutes or until they've become lightly fragrant. In a blender, combine all the ingredients (except yogurt) for the marinade and the dry-roasted spices with a little water, and blend it into a smooth, thick paste. Marinate the chicken with this paste and the yogurt and let it rest overnight in the fridge or for at least 2 hours. In a large pan, heat 6 tbsps of vegetable oil. Saute the onions until they turn light brown. Add the marinated chicken, stir thoroughly and bring to a boil. Turn the heat to medium and cook for about 15 minutes with the lid on and another 10 minutes without the lid, until the chicken is well cooked and there is around 20 per cent of thick gravy left. Rinse the basmati rice and soak in water for 30 minutes then drain the rice in a colander. In a deep large pot, on low heat, add 2 tbsps of ghee along with the bay leaf. Open the cardamom pods, leaving the seeds inside, and toss them into the pot with the star anise, cinnamon and mace. Add the drained rice and saute for about 2 minutes. Add water and salt, and check for seasoning. Bring it to a boil, then lower the heat and cook for another 7-8 minutes. When all the liquid has been absorbed, take the pot off the heat, leave the lid on and let it rest for about 20 minutes. This helps to let the starch absorb the dampness and the rice will be perfectly cooked. Using a fork, fluff the rice to ensure the grains do not stick and clump together. Cut the onions thinly, lengthwise. Shallow-fry them until they turn golden brown. Drain the fried onions on a kitchen towel. Set aside. Coat a large ovenproof or steel pot with a thin layer of ghee. For the first layer, add half of the cooked chicken along with some gravy to create a thin layer, then add a layer of rice over the chicken, and spread half of the fried onions over the rice. Continue with one more layer of chicken, rice and top it off with the fried onions. Cover the pot with 2 layers of aluminium foil, tucking in the sides and sealing it well. Place the pot into the oven, lower the oven temperature to 120C, and leave it in there for 30 minutes. By doing this, the juices and flavour from the gravy will be absorbed into the rice. Remove the pot from the oven and let it cool for 5 minutes before stirring gently, going all the way to the bottom to mix the biryani. Do not over-mix. For vegetarians, replace the meat with cauliflower, beans and carrots or any other vegetable of your choice. Excellent recipe! Easy to follow. Great recipe to follow and everyone enjoyed it. Happy to share wide….Thank you !